Apple will allow up to 2 lines of free engraved text on the back of an iPad purchased from Apple.com as an "Apple Online Store exclusive," confirming a July rumor that Apple would extend its free laser-engraving option from the iPod to the iPad this fall. Custom engraved iPods have been available from the Apple online store for several years. Customers are given the option to engrave their iPad after selecting an iPad model and any desired accessories from the online store. Engraved iPads are non-returnable, so prospective buyers are cautioned to double-check their spelling. Also, customers should take note that adding the engraving option currently lengthens the shipping time from "Within 24hrs" to "1-3 business days." The iPad is widely expected to be a "must have" gift this holiday season, with some analysts worrying that Apple may not be able supply enough tablets to meet demand. Apple has struggled to keep the device in stock since it was released in April. Though production of the tablet device seems to have caught up to orders, with shipping times of "Within 24hrs" for all six models of the tablet device, holiday demand could easily outpace supply. Oppenheimer analyst Yair Reiner predicts Apple will sell as many as 6.5 million iPads from October to December. In preparation for the holiday season, Apple has greatly broadened the retail availability of the iPad. The device will be available at Walmart, Target, AT&T and Verizon stores. With over 7 million units sold in just two quarters of availability, the iPad has already become a major part of Apple's revenue, accounting for $2.8 billion in revenue during the September quarter. In fact, the iPad could do so well as to eat into sales of other devices. To Apple CEO Steve Jobs, iPad cannibalization of notebook computers is an inevitability. "The iPad is clearly going to affect notebook computers," Jobs said during the company's fourth fiscal quarter 2010 earnings call. "I think the iPad proves it's not a question of if, it's a question of when." So guys, what are you witty suggestions? I might do this for my dad and nephew. All that space, Apple should offer some images or a pattern to be places on the back. Even something a simple as snowflakes or stars. You mean quote tge entire article to post one line? Free iPad engraving is Apple's way of preventing people from returning Christmas presents for the updated model due to be released in January. & That would be good, if they release something in January. Steer clear of engravings if you ever plan to resell your iPad down the road. unfortunatley that doesn't "fit on the iPad" engraving, otherwise i would have bought one just to have that written on it. This will be useful for the many companies giving away iPads as promotional items, as well as companies buying large quantities to use internally. Your probably right. Apple wants to push as many iPads out the door so that early next spring, early adopters can feel REALLY stupid for taking the first version. I bought one the day it came out, I love it, but I do wish it had a camera for facetime. I don't feel stupid at all. I paid USD$1,000 for a iPad 3G 32GB back in July or so, and until now it's still not released in my country. Looks like it won't be released until next year, since Apple has to seriously, seriously stock up for holiday buying frenzy in the US and current 26 countries where iPad is officially available. Then again, I haven't seen the iPad 2 yet. 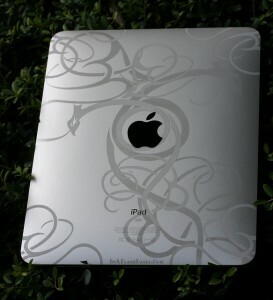 Since April we've been building our portfolio of laser engraved iPads. It's been great to see what our customers come up with. There's definitely a lot more room to play with on an iPad than the iPods, especially with how tiny the iPods have become. What about MacBook Air engraving?